Let's Do It for ME! : Small charity - BIG Cause - Big Break! You can only vote once so there's no need for daily voting - but to increase the chance of winning please share and tweet etc. 1st prize is £2,000. 2nd prize is £1,000 and a further £2,000 will be divided between the runners-up. 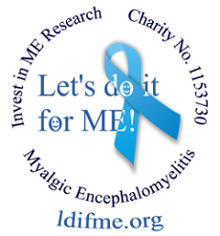 The Invest in ME biomedical research fund is currently at £88,100 and winning this would help us reach the initial £100,000 target of the Let's do it for ME campaign to fund the foundation research project at the University of East Anglia - please see our main website or Invest in ME for full details. Thank you for your support - Let's vote for Invest in ME!